Pi-Cars appears in the new book Raspberry Pi For Dummies by Sean McManus and Mike Cook, in a chapter at the end that outlines some inspiring Raspberry Pi projects. Other projects that were highlighted in the last chapter include a talking reporting system for a boat, automated Halloween lights, a jukebox and a weather station. 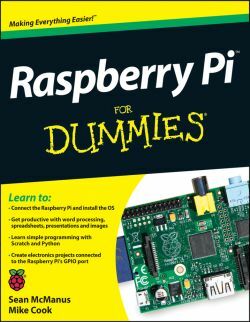 You can find out more about Raspberry Pi For Dummies and how to buy at Sean’s website – click here. You can buy a Pi-Car or Took Kit at our Embark-ideas website – click here. The Raspberry Pi for Dummies book written by Sean McManus and Mike Cook features Pi-Cars in the 10 projects to do with your Pi-Car. This entry was posted in Blog and tagged learning electronics, learning programming, pi-cars, python, raspberry pi, raspberry pi for dummies, scratch, Tool Kit. Bookmark the permalink.